(?) De Beaufort married Cornelia Anna Van Westreenen, daughter of (?) Van Westreenen and Antoinette Charlotte Godin. Aarnoud De Beaufort was born in 1797. He was the son of (?) De Beaufort and Cornelia Anna Van Westreenen. Aarnoud De Beaufort died in 1866. Married Name Her married name was Van Heemstra. Wilhelmina De Beaufort married (?) Van Heemstra. Wilhelmina De Beaufort was born in 1843. She was the daughter of Aarnoud De Beaufort. Wilhelmina De Beaufort died in 1927. (?) Van Heemstra married Wilhelmina De Beaufort, daughter of Aarnoud De Beaufort. Aarnoud Jan Van Heemstra was born in 1871. He was the son of (?) Van Heemstra and Wilhelmina De Beaufort. Aarnoud Jan Van Heemstra died in 1957. Married Name Her married name was Hepburn. Ella Van Heemstra married Joseph Anthony Hepburn Ruston. Ella Van Heemstra was born in 1900. She was the daughter of Aarnoud Jan Van Heemstra. Ella Van Heemstra died in 1984. Joseph Anthony Hepburn Ruston married Ella Van Heemstra, daughter of Aarnoud Jan Van Heemstra. Name Variation Audrey Hepburn was also known as Audrey Kathleen Ruston. Audrey Hepburn was born in 1929. She was the daughter of Joseph Anthony Hepburn Ruston and Ella Van Heemstra. Audrey Hepburn died in 1993. British-American Actress. Audrey Kathleen Ruston (Audrey Hepburn), born in Belgium, continues to be a figure of iconic beauty and classic film. Her award-winning role in "Roman Holiday" marked the beginning of her long and successful movie career. Hepburn is also well-known for her humanitarian work with UNICEF. Mary E. Buckley was born on 18 November 1830. She was the daughter of William J. Buckley and Lucretia Proctor. Mary E. Buckley died on 10 December 1840 at age 10. 1840 Porter, Scioto, Ohio Mary E. Buckley was referenced on William J. Buckley's household in the 1840 Census at Porter, Scioto, Ohio; listed as William Buckle; Number of Free White Persons - Under 20 = 6 (2 male & 4 female); Number of Free White Persons - 20 thru 49 = 2 (1 male & 1 female); Total Number of Free White Persons = 8. John H. Buckley was born on 6 May 1832. He was the son of William J. Buckley and Lucretia Proctor. John H. Buckley died on 12 May 1832. Annah J. Buckley was born on 6 April 1833. Etha L. Buckley was born on 4 February 1848. Etha L. Buckley died on 4 November 1849 at age 1. Married Name 1900 As of 1900,her married name was Warner. Catherine B. (?) was born in March 1876 at Missouri. She married Francis M. Warner in 1900 at both previously married married between Jan-June 1900. Catherine B. (?) died before 1910. Catherine B. (?) had 3 with 2 living in 1900 children. Name Variation Mollie May Tryon was also known as Molly. Married Name 7 July 1906 As of 7 July 1906,her married name was Chapman. Married Name after 1930 As of after 1930,her married name was Simmons. Married Name after 1931 As of after 1931,her married name was Murdock. 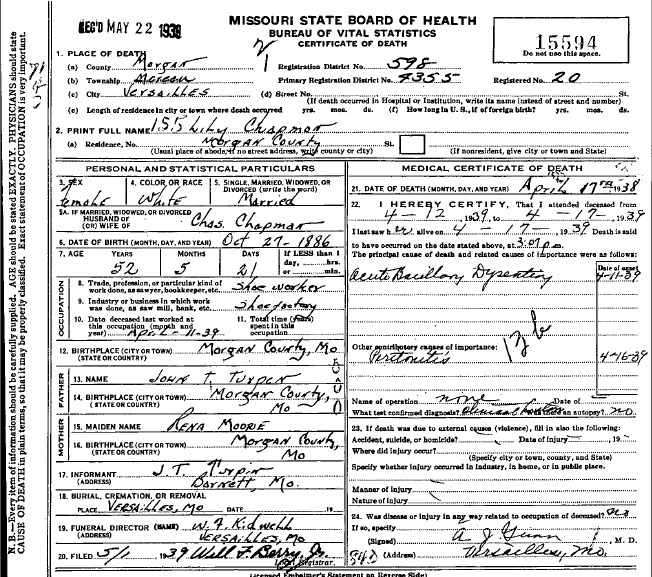 Mollie May Tryon was born on 14 September 1888 at Margan, Miller, Missouri, twin with Nellie. She was the daughter of John Tryon and Lydia M. (?). Mollie May Tryon and James Edward Chapman were divorced before 1930. Mollie May Tryon died on 23 November 1977 at Missouri at age 89. Mollie May Tryon had 2 with 2 living in 1910 children. [S245] U.S. Federal Census 1900 U.S. Federal Census, by Ancestry.com, Year: 1900; Census Place: Osage, Morgan, Missouri; Roll: 877; Page: 5B; Enumeration District: 0078; FHL microfilm: 1240877. John R. Moore was born on 29 August 1861 at Missouri also reported as Aug 1862. He was the son of (?) Moore and unknown (?). John R. Moore married Mary Lou Chapman, daughter of Robert C. Chapman and Martha Buckley, on 1 November 1889. John R. Moore and Mary Lou Chapman were divorced before 1910. John R. Moore died on 9 March 1919 at Morgan, Missouri, at age 57. [S244] U.S. Federal Census 1910 U.S. Federal Census, by Ancestry.com, Year: 1910; Census Place: Osage, Camden, Missouri; Roll T624_772; Page: 8A; Enumeration District: 33; Image: 1106. Name Variation Lily May Turpin was also known as Lillie. Name Variation Lily May Turpin was also known as Lilly. Married Name circa 1903 As of circa 1903,her married name was Chapman. Lily May Turpin was born on 27 October 1886 at Morgan, Missouri. She was the daughter of John T. Turpin and Rena Moore. Lily May Turpin married Charles Albert Chapman, son of Thomas Albert Chapman and Martha Buckley, circa 1903. Lily May Turpin was a shoe worker at shoe factory in 1938. [S250] U.S. Federal Census 1930 U.S. Federal Census, by Ancestry.com, Year: 1930; Census Place: Moreau, Morgan, Missouri; Roll 1213; Page: 4A; Enumeration District: 8; Image: 964.0. 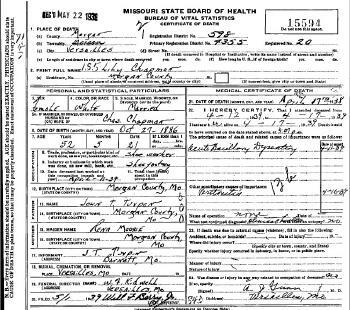 John Oliver Kays was born on 14 January 1868 at Morgan, Missouri, also reported as Jan 1867. John Oliver Kays and Emma Chapman were divorced before 1910. John Oliver Kays died on 17 July 1930 at Morgan, Missouri, at age 62. Name Variation Jennie Gaston was also known as Eliza Jennie. Married Name circa 1900 As of circa 1900,her married name was Chapman. Jennie Gaston was born in May 1880 at Missouri. She was the daughter of (?) Gaston and Ellen (?). As of 4 June 1900, Jennie Gaston was never married. At Adair, Camden, Missouri, in 1900 census record, listed as single. She married Thomas William Chapman, son of Robert C. Chapman and Martha Buckley, circa 1900. Jennie Gaston died in May 1922. She was buried on 16 May 1922 at Grand Army of the Republic Cemetery, Miami, Ottawa, Oklahoma. Name Variation Virginia Mae Moore was also known as Virgia. Virginia Mae Moore was born on 21 February 1891 at Missouri. She was the daughter of John R. Moore and Mary Lou Chapman. Virginia Mae Moore died in February 1985. Emma L. Moore was born in January 1893 at Missouri. Emma L. Moore died before 1945. Married Name 31 January 1915 As of 31 January 1915,her married name was McKinley. Nova Ester Moore was born in July 1896 at Missouri. Nova Ester Moore married James Newton McKinley on 31 January 1915. Nova Ester Moore died in 1974. Married Name Her married name was Watson. Carrie L. Moore married (?) Watson. Carrie L. Moore was born in January 1899 at Missouri. Carrie L. Moore died after 1945. James Newton McKinley was born circa 1898 at Missouri. He married Nova Ester Moore, daughter of John R. Moore and Mary Lou Chapman, on 31 January 1915. Isaac Haney was born on 2 April 1816 at Virginia also reported as circa 1804. He was the son of Peter Haney and Barbara Louderback. Isaac Haney married Rebecca Jane Proctor, daughter of William Proctor and Anna Martin, on 16 August 1835. Isaac Haney died on 10 May 1871 at Harrisonville, Scioto, Ohio, at age 55. [S249] U.S. Federal Census 1850 U.S. Federal Census, by Ancestry.com, Year: 1850; Census Place: Harrison, Scioto, Ohio; Roll M432_727; Page: 117B; Image: 111. [S248] U.S. Federal Census 1860 U.S. Federal Census, by Ancestry.com, Year: 1860; Census Place: Harrison, Scioto, Ohio; Roll M653_1033; Page: 488; Image: 427; Family History Library Film: 805033. [S247] U.S. Federal Census 1870 U.S. Federal Census, by Ancestry.com, Year: 1870; Census Place: Valley, Scioto, Ohio; Roll M593_1265; Page: 674B; Image: 688; Family History Library Film: 552764. Wilson Simpson Haney was born on 24 August 1843. He was the son of Isaac Haney and Rebecca Jane Proctor. Wilson Simpson Haney married Nell Smith on 25 September 1900 at Ohio. Wilson Simpson Haney died on 9 October 1911 at age 68. Union Soldier during American Civil War/War Between the States. Married Name 25 September 1900 As of 25 September 1900,her married name was Haney. Nell Smith was born on 7 January 1871 at Ohio. She married Wilson Simpson Haney, son of Isaac Haney and Rebecca Jane Proctor, on 25 September 1900 at Ohio. Clara Mae Haney was born on 15 April 1909 at Ohio. She was the daughter of Wilson Simpson Haney and Nell Smith. Name Variation Birdie Haney was also known as Berda Alice. Birdie Haney was born on 2 September 1901 at Ohio. Name Variation Sally Haney was also known as Sarah. Sally Haney was born circa 1838 at Ohio. She was the daughter of Isaac Haney and Rebecca Jane Proctor. Name Variation John Thompson Haney was also known as Thompson. John Thompson Haney was born circa 1840 at Ohio.